Okay, time to 'fess up. 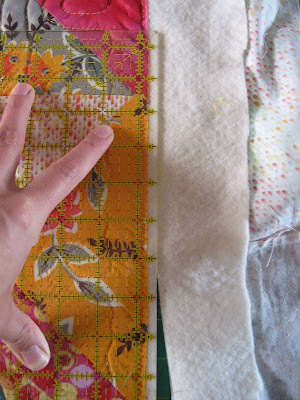 How many of you go through the process of squaring up your quilts? I'll admit that I didn't think about it for the longest time. 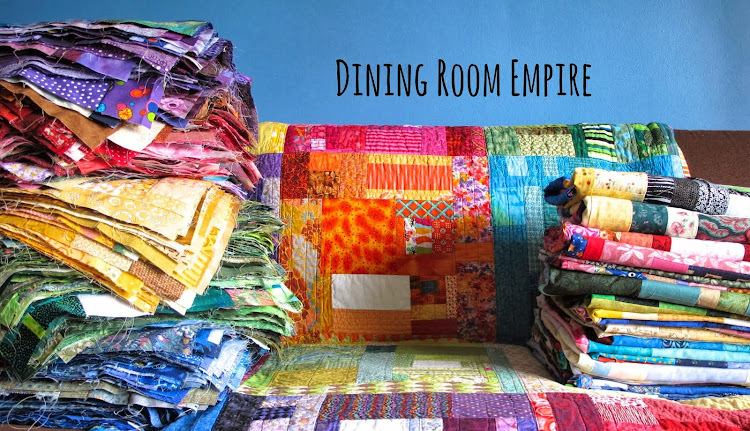 All the methods I had seen seemed like they required a ridiculous amount of floor space and the ability to block the quilt, like you would a new knit. Squaring up a quilt really isn't that hard, but it is a step that slows you down when all you want to do is get that binding on and see what you quilt is going to be. It always helps to stay as square as possible along the way. Check each block as you go, and fudge seams if necessary when putting tops together. 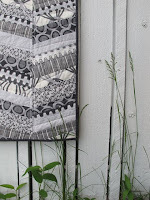 If you are using borders there is also a way to help bring a skewed quilt into square or ensure it stays square, but that's another tutorial! I've always done my best to stay as square as possible during construction, but the evolution of my design aesthetic now sees the majority of my quilts finished without borders and not necessarily square blocks. That same evolution has led me to the following technique. See if it works for you. You don't need any special tools to do this. Your sewing machine, thread, a large table top, self-healing cutting mat, rotary cutter, and a ruler at least 12 inches square. Before you get started decide on how much extra batting, if at all, you want your binding to contain. I cut a quarter inch from the edge of my quilt top. 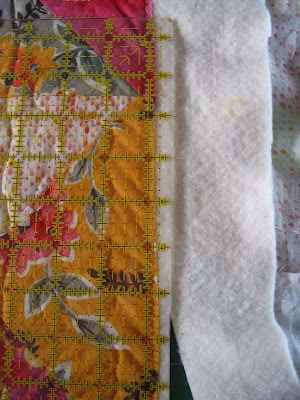 My binding is then attached flush with the quilt top's edge with a quarter inch seam allowance. Folded over I can then hand sew the binding and it perfectly covers the seam from attaching the binding. If you want a less substantial binding then you could cut closer to the top's edge and use a smaller binding. 1. 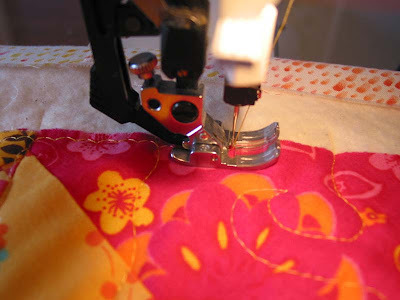 Set your machine to a zig zag stitch that is small in width but long in stitch length. 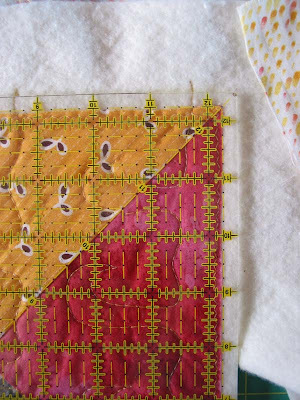 Stitch around the entire perimeter of your quilt, through all three layers. 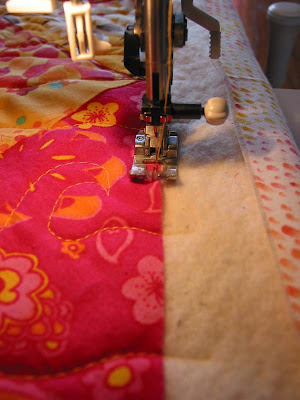 This essentially turns your quilt a solid piece of fabric, reducing the potential for movement when you attach your binding. Ensure you stay as close to the edge as possible. If you have a walking foot, use it. I have an even feed foot on my machine and that's what I use. Oh, and take it from me, ensure that you have a throat plate in your machine that can accommodate a zig zag stitch! I nearly lost an eye when my needle broke. This stitch will be entirely hidden by your binding. 3. Start in one corner. Line up the corner of the quilt top with the corner of the ruler, a quarter inch in from the edge. This is where the actual process of squaring begins. 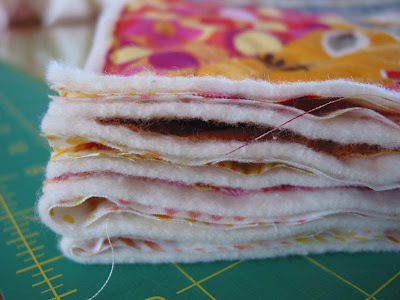 From the corner you will want to keep the quarter inch markings in line with your quilt top's edge. To do this you may need to pull the quilt into square. Hold the ruler down firmly but not so hard that you can't pull the fabric with your cutting hand. I find that my thumb holds the ruler more firmly, and thus holds the quilt in place, and that I can move the fabric near the top of my ruler. (see picture below). Pull the quilt, holding on to the batting and backing fabric until it is in line with the quarter in marks. You may have to pull the inside of the quilt in, rather than the edge out. Just go slow and pull as necessary. When you have it lined up with your ruler, cut it for the length of the ruler only. From the first cut, move your ruler up. Overlap up the cut edge by a few inches with the ruler, keeping the cut edge and the ruler's edge in line together. Then line-up your quilt top's edge with the quarter inch mark. 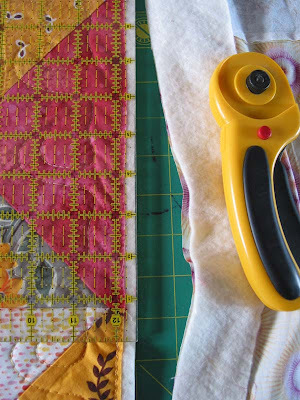 As you finish one cut, move the ruler up the edge of the quilt (keeping the quilt on your cutting mat). Constantly realign the quilt top's edge with that quarter inch mark. 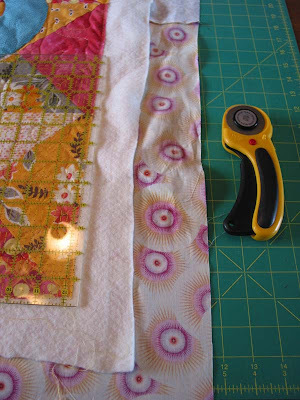 Pull the fabric as necessary to bring the quilt top's edge into alignment. Always hold the ruler firmly as you cut. Continue around the edge of the quilt until you get to the next corner. This technique has worked very well for me. And when all is said and done, it doesn't take more than a half hour to do a large quilt. Once you have it all squared away attach your preferred binding. I'll show you that in my next tutorial. That doesn't seem very hard...wonder why I have never actually done that?? Thank you for the easy steps! I have a quick question though. Do you trim the corners down? I always seems to have a bit of a hard time with having my mitered binding lay correctly in the corner and end up whacking off the corner batting. Is there a better way here? Thank you again! Your tutes are always so clear! You rock. Shanna, I don't trim the corners down, but with the way I attach my binding, I find I don't have any problems. 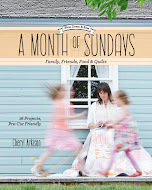 Watch for the next tutorial on easy mitred bindings. I usually sew around the perimeter of the quilt first to tack down all the edges, but I don't trim the bulk off. it would be easier to attach the binding this way! This is a great tutorial - thanks! I'd never thought about squaring up before but I think I'll try it on my next quilt. thanks for this tute. i especially found the advice about zigzagging the edge of the quilt great - only have to worry about the binding when sewing it on, not the quilt top moving against the backing, against the wadding etc. i'm new to quilting and methods that make it easier are awesome. TY for the tute. But I do have a question. You are squaring up the quilt based on the quilt top. If the quilt top is out of square, won't your entire quilt be out of square? 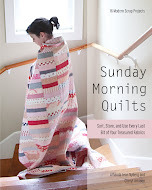 How do you ensure that the quilt top is square? TY. Thank you so much, it's a very good idea. I'll try it. I read you from France.merci ! My longarmer has been trimming my quilt for me and I notice that she also leaves a quarter inch of batting. However, if you sew your binding on with a quarter inch seam don't you risk not encasing all your batting into the seam?